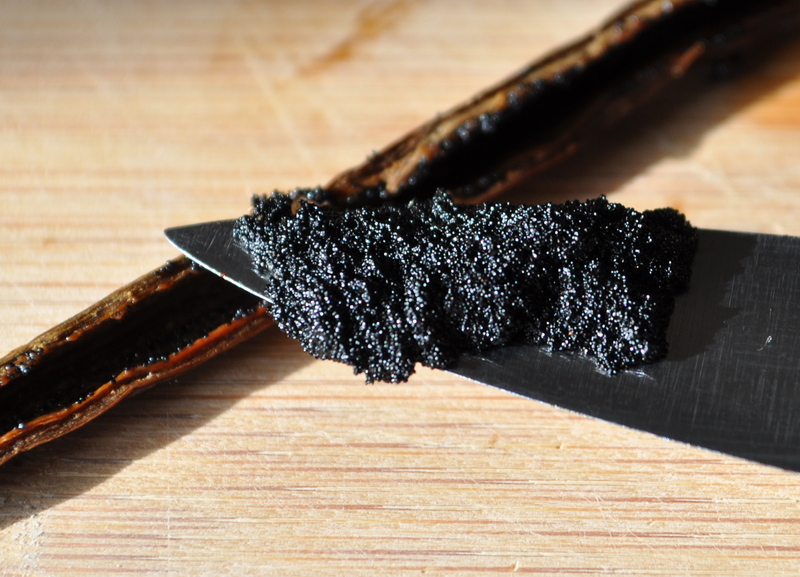 Here we show you how to open, split, and scrape a whole vanilla bean in 4 easy steps! Step 1 – Put the vanilla beans on a cutting board with their flat side down, facing away from you. The curled tip will be pointing toward the left- hand side of the cutting board. Step 2 – Place the tip of your sharp knife in the middle of the vanilla bean, slightly below the curled top. Step 3 – Carefully cut into the vanilla bean while you hold the top down on the board. Use your left index finger and thumb to hold it. Only slice the top layer of the bean. Do not cut through to the other side. Slice along the middle until you get to the end. If you are using the bean whole, like to make extract, you are done. The bean is split. Step 4 – If your recipe requires the vanilla bean caviar be removed, pull apart the vanilla bean, slightly. Hold the bean on the cutting board. Turn the knife sideways and run the blade from the curled top to the bottom of the vanilla bean. The caviar will easily slide off the vanilla bean skin onto your knife in a thick, gooey lump. See, I told you that it would be easy! When you scrape a vanilla bean it is always a perfect opportunity for a few creative photos. Be sure to share them with us below!